This name uses Eastern Slavic naming customs; the patronymic is Maksimovich and the family name is Primakov. Yevgeny Maksimovich Primakov (Russian: Евге́ний Макси́мович Примако́в, tr. Yevgeniy Maksimovich Primakov; 29 October 1929 – 26 June 2015) was a Russian politician and diplomat who served as Prime Minister of Russia from 1998 to 1999. 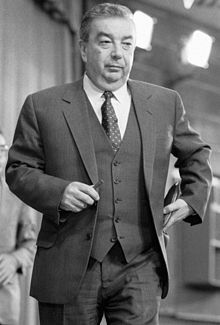 During his long career, he also served as Foreign Minister, Speaker of the Supreme Soviet of the Soviet Union, and chief of the intelligence service. Primakov was an academician (Arabist) and a member of the Presidium of the Russian Academy of Sciences. Primakov was born in Kiev in the Ukrainian SSR and grew up in Tbilisi in the Georgian SSR. His parents were Jewish and the family name was originally Finkelstein, but was later changed to Primakov. His father, according to most records, had been sent to the gulags during the Stalinist purges. His mother was Anna Yakovlevna Primakova, who worked as an obstetrician and a cousin of the famous physiologist Yakov Kirshenblat. He was educated at the Moscow Institute of Oriental Studies, graduating in 1953, and did postgraduate work at Moscow State University. From 1956 to 1970, he worked as a journalist for Soviet radio and a Middle Eastern correspondent for Pravda newspaper. During this time, he was sent frequently on intelligence missions to the Middle East and the United States as a KGB co-optee under codename MAKSIM. As the Senior Researcher of the Institute of World Economy and International Relations, Primakov entered in 1962 the scientific society. From 30 December 1970 to 1977, he served as Deputy Director of Institute of World Economy and International Relations of the USSR Academy of Sciences. From 1977 to 1985 he was Director of the Institute of Oriental Studies of the USSR Academy of Sciences. During this time he was also First Deputy Chairman of the Soviet Peace Committee. In 1985 he returned to the Institute of World Economy and International Relations, serving as Director until 1989. Primakov became involved in politics in 1989, as the Chairman of the Soviet of the Union, one of two houses of the Soviet parliament. From 1990 until 1991 he was a member of Soviet leader Mikhail Gorbachev's Presidential Council. He served as Gorbachev's special envoy to Iraq in the run-up to the Persian Gulf War, in which capacity he held talks with President Saddam Hussein. After the failed August 1991 putsch, Primakov was appointed First Deputy Chairman of the KGB and Director of the KGB First Chief Directorate responsible for foreign intelligence. After the formation of the Russian Federation, Primakov shepherded the transition of the KGB First Chief Directorate to the control of the Russian Federation government, under the new name Foreign Intelligence Service (SVR). Primakov preserved the old KGB foreign intelligence apparatus under the new SVR label, and led no personnel purges or structural reforms. He served as SVR director from 1991 until 1996. Primakov served as Minister of Foreign Affairs from January 1996 until September 1998. As foreign minister, he gained respect at home and abroad the reputation as a tough but pragmatic supporter of Russia's interests and as an opponent of NATO's expansion into the former Eastern bloc, though on 27 May 1997, after five months of negotiation with NATO Secretary General Javier Solana, Russia signed the Foundation Act, which is seen as marking the end of Cold War hostilities. He supported Slobodan Milošević during the Yugoslav Wars. He was also famously an advocate of multilateralism as an alternative to American global hegemony following the collapse of the USSR and the end of the Cold War. Primakov called for a Russian foreign policy based on low-cost mediation while expanding influence towards the Middle East and the former Soviet republics. Beginning in 1999, he promoted Russia, China, and India as a "strategic triangle" to counterbalance the United States. The move was interpreted by some observers as an agreement to fight together against 'color revolutions' in Central Asia. After Yeltsin's bid to reinstate Viktor Chernomyrdin as Prime Minister was blocked by the State Duma in September 1998, the President turned to Primakov as a compromise figure whom he rightly judged would be accepted by the parliament's majority. As Prime Minister, Primakov was given credit for forcing some very difficult reforms in Russia; most of them, such as the tax reform, became major successes. Following the 1998 harvest, which was the worst in 45 years, coupled with a plummeting ruble, one of Primakov's first actions as Prime Minister, in October 1998, was to appeal to the United States and Canada for food aid, while also appealing to the European Union for economic relief. While Primakov's opposition to perceived US unilateralism was popular among Russians, it also led to a breach with the West during the 1999 NATO bombing of Yugoslavia, and isolated Russia during subsequent developments in the former Yugoslavia. On 24 March 1999, Primakov was heading to Washington, D.C. for an official visit. Flying over the Atlantic Ocean, he learned that NATO had started to bomb Yugoslavia. Primakov decided to cancel the visit, ordered the plane to turn around over the ocean and returned to Moscow in a manoeuvre popularly dubbed "Primakov's Loop". Yeltsin fired Primakov on 12 May 1999, ostensibly over the sluggish pace of the Russian economy. Many analysts believed the firing of Primakov reflected Yeltsin's fear of losing power to a more successful and popular person, although sources close to Yeltsin said at the time that the president viewed Primakov as being too close to the Communist Party. Primakov himself would have had good chances as a candidate for the presidency. Yevgeny Primakov had refused to dismiss Communist ministers while the Communist Party was leading the process of preparing unsuccessful impeachment proceedings against the president. Ultimately, Yeltsin resigned at the end of the year and was succeeded by his last prime minister, Vladimir Putin. Primakov's dismissal was extremely unpopular with the Russian population: according to a poll, 81% of the population did not approve of the decision, and even among the liberal pro-Western party Yabloko supporters, 84% did not approve of the dismissal. Before Yeltsin’s resignation, Primakov supported the Fatherland – All Russia electoral faction, which at that time was the major opponent of the pro-Putin Unity, and launched his presidential bid. Initially considered the man to beat, Primakov was rapidly overtaken by the factions loyal to Vladimir Putin in the Duma elections in December 1999. Primakov officially abandoned the presidential race in his TV address on 4 February 2000 less than two months before the 26 March presidential elections. Soon he became an adviser to Putin and a political ally. On 14 December 2001, Primakov became President of the Russian Chamber of Commerce and Industry, a position he held until 2011. In February and March 2003, he visited Iraq and talked with Iraqi President Saddam Hussein, as a special representative of President Putin. He brought to Baghdad a message from Putin to call for Saddam to resign voluntarily. He tried to prevent the 2003 U.S.-led invasion of Iraq, a move which received some support from several nations opposed to the war. Primakov suggested that Saddam must hand over all Iraq's weapons of mass destruction to the United Nations, among other things. However, the Iraqi leader told Primakov he was confident that no harm would befall him personally—a belief that was later proven incorrect. Primakov later claimed Saddam's execution in 2006 was rushed to prevent him from revealing information on Iraq–United States relations that could embarrass the U.S. government. In November 2004, Primakov testified in defense of the former Yugoslav President Slobodan Milošević, on trial for war crimes. He had earlier led a Russian delegation that met with Milošević during the NATO bombing of Yugoslavia in 1999. Primakov stepped down as President of the Russian Chamber of Commerce and Industry on 4 March 2011. Since 1988, Primakov was the Academician Secretary of the World Economy and International Relations Division, director of the Institute of World Economy and International Relations and the member of the Presidium of the USSR Academy of Sciences. On 26 May 2008, Primakov was elected as a member of the Presidium of the Russian Academy of Sciences. In 2009, the University of Niš, Serbia awarded Primakov an honorary doctorate. In honor of Primakov in 2015 started Primakov Readings - the annual international summit aimed at promoting dialogue on current global trends in the world economy, international politics and security among high-ranking experts, diplomats and decision-makers from around the Globe, organized by the Institute of World Economy and International Relations and held in Moscow. Primakov died in Moscow after prolonged illness (liver cancer) at the age of 85. He was buried with military honours at Novodevichy Cemetery. Recipient of the Hugo Grotius Prize for the huge contribution to the development of international law and for the creation of a multipolar world doctrine (2000). ^ Примаков Е. М. Встречи на перекрестках. ISBN 978-5-227-05739-6. ^ Richard C. S. Trahair; Robert L. Miller (18 October 2013). Encyclopedia of Cold War Espionage, Spies, and Secret Operations. Enigma Books. p. 346. ISBN 9781936274260. ^ Robert A. Saunders; Vlad Strukov (13 May 2010). Historical Dictionary of the Russian Federation (illustrated ed.). Scarecrow Press. p. 464. ISBN 9780810874602. ^ Primakov, Yevgeni (11 March 1991). "Diplomacy: My Final Visit with Saddam Hussein". Time. Retrieved 26 June 2015. ^ Garthoff, Raymond L. (1994). The Great Transition: American-Soviet Relations and the End of the Cold War. Washington, D.C.: Brookings Institution. p. 435. ISBN 0-8157-3060-8. ^ Waller, J. Michael. "Who Is Making Russian Foreign Policy?". Perspective, Boston University Institute for the Study of Conflict, Ideology and Policy. ^ Quinn, Paul (9 November 1998). "Russia's New Icon". Time. Retrieved 8 May 2013. ^ "Obituary: Yevgeny Primakov: Steel and shadows". The Economist. Retrieved 17 July 2015. ^ Heintz, Jim (26 June 2015). "Former Russian PM Yevgeny Primakov dies at 85". WSPA 7. Archived from the original on 27 June 2015. Retrieved 26 June 2015. ^ Chandra, Amresh (2010). "Strategic Triangle among Russia, China and India: Challenges and Prospects" (PDF). Journal of Peace Studies. Archived from the original (PDF) on 27 June 2015. Retrieved 26 June 2015. ^ Aslund, Anders (2008). "An Assessment of Putin's Economic Policy" (2). CESifo Forum. ^ Michael R. Gordon, Facing Severe Shortage of Food, Russia Seeks Foreign Relief Aid. New York Times, October 10, 1998. Retrieved 2016-08-09. ^ Tsygankov, Andrey P. (2013). Russia's Foreign Policy: Change and Continuity in National Identity. Rowman & Littlefield. pp. 108–113. ISBN 9781442220003. ^ "Yeltsin Fires Prime Minister Primakov; Crisis Clouds IMF Loans, Kosovo Pact". The Wall Street Journal. 13 May 1999. Retrieved 26 June 2015. ^ Lally, Kathy (13 May 2015). "Yeltsin dismisses Primakov". The Baltimore Sun. Retrieved 26 June 2015. ^ Hoffman, David (13 May 1999). "Citing Economy, Yeltsin Fires Premier". The Washington Post. Retrieved 26 June 2015. ^ "Primakov, Yevgeny Maximovich". The Columbia Encyclopedia. 2014. Retrieved 26 June 2015. ^ Hoffman, David (1 January 2000). "Yeltsin Resigns: 'I Did All I Could'". The Washington Post. Retrieved 26 June 2015. ^ Reynolds, Maura (18 August 1999). "Anti-Kremlin Bloc to Be Led by Primakov". Los Angeles Times. Retrieved 26 June 2015. ^ Zolotov Jr., Andrei (14 July 2000). "Primakov Finds Role In Putin's Kremlin". The Moscow Times. Retrieved 26 June 2015. ^ "Saddam execution rushed to stop him 'having last word': Primakov". Pakistan Ki Awaz. 15 January 2007. Retrieved 26 June 2015. ^ Simons, Marlise (7 December 2004). "A Warmer Tone in Court as Milosevic Pursues His Defense". The New York Times. Retrieved 26 June 2015. ^ "Primakov: Milosevic ready in principle to talk peace". CNN. 30 March 1999. Retrieved 26 June 2015. ^ "Primakov steps down from Russia's Chamber of Commerce", RIA-Novosti, 21 February 2011. ^ "Primakov počasni doktor Univerziteta u Nišu". Južne vesti, Internet novine. 16 May 2009. Retrieved 14 June 2012. ^ "International Think Tank Summit «Primakov Readings»". www.imemo.ru (in Russian). Retrieved 25 April 2018. ^ "Умер Евгений Примаков". Kommersant. 26 July 2015. ^ Примаков похоронен с воинскими почестями на Новодевичьем кладбище (in Russian). Russian News Agency "TASS". 29 June 2015. Retrieved 29 June 2015. ^ Primakov & 2004 188. Primakov, Yevgeny (2004). Russian Crossroads: Towards the New Millennium. Yale University Press. ISBN 0-300-09792-1. Wikimedia Commons has media related to Yevgeny Primakov.